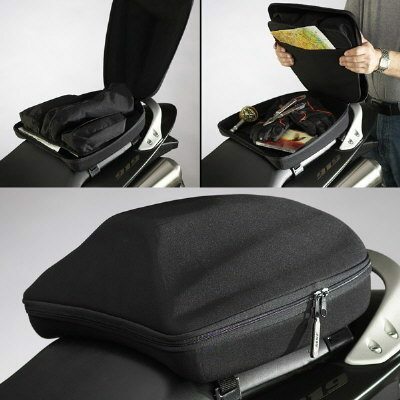 Super sports rear seat bag , sports tour luggage pod - adds tour capability to your bike without destroying the looks or aerodynamics . coated hooks attach it to the bike. Thinking ahead, ZTechnik included plenty of length in the web straps to make mounting the bag – under the seat, to the rear tail cowling, or through a rack– an easy process.. Web straps have vinyl coated hooks to prevent sratching or scuffing your motorcycle's finish. Dimesions: H: 4.5-6 in. W: 9-12.5 in. L:13.75 in.